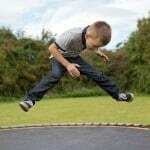 Trampoline exercise has many health benefits than you can imagine. 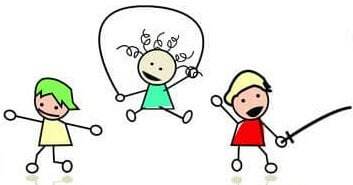 From losing weight and keeping fit to increasing lymphatic flow in the body, these are goodies that your child should not miss. 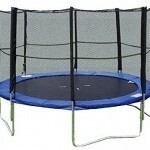 A quality trampoline will deliver such results while at the same time provide exceptional play time for kids. Such great trampolines are ones from Upper Bounce Company. Upper Bounce specializes in manufacturing high-quality trampolines that deliver fun and safety for the whole family. 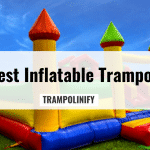 They offer a wide range of trampolines, replacement parts and accessories that are compatible with most other trampoline types and models. The company is dedicated to providing the highest caliber of service with a mission to address and fulfill customer’s needs. This is evident in their trampolines which are customized for different uses and adapt to various situations. The Upper Bounce 16ft model and the 17ft trampoline are ideal examples of what the company can bring to the kids playing grounds. Let’s take a look at what they have to offer and why they can be a great addition to your kids playing gear. 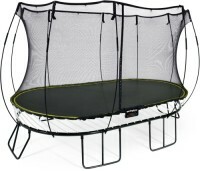 The Upper Bounce 16ft Trampoline is specially designed to make it easy to assemble and take apart. Upper Bounce must have read many reviews written by customers who found it hard to set up their trampolines and they made sure the 16ft trampoline will cause no major challenge at all. The assembly instructions are pretty straightforward and the whole thing goes up in a few hours or less. The advantage of this trampoline is that you can easily disassemble it too. This is important during the winter when children have to stay indoors. You can take down this trampoline without using any special hardware and store it indoors for it to last longer. This also saves you from frequent replacement of trampoline parts that may damage if left in exposure to the elements. If taking it inside is daunting, you can opt for the offered weather covers to protect your trampoline from the elements. The steel frame and legs have a special coating that makes them more durable, rust-resistant and tougher. Sometimes you will not have to store the frame and legs indoors as they are designed for prolonged outdoor use. The galvanized powder coating even makes the free good looking. The frame also features a welded joint with an opening for the enclosure pole at each leg. This ensures the poles stand tall and sturdy while attached to the frame. They also enhance assembly and disassembly of the trampoline. Just like all other Upper Bounce trampolines, the mat features an ultra-durable construction thanks its premium polypropylene mesh material. Additionally, the mat has 8-row stitching which ensures more security and prevents it from tearing, bringing several years of enjoyment. Great trampolines come with high-quality enclosures and the one on Upper Bounce 16ft trampoline is a genuine example that ensures maximum safety for your family. Apart from being high enough for real protection, it has a dual entry closure with zipper and buckles. Worth mentioning is that the safety net is made from 100% premium Terylene mesh material which guarantees maximum durability and adds extra security due to its small gaps. The no-gap enclosure eliminates the dangerous gaps between the jumping surface and the enclosure net by attaching the net at every V-ring spring clip. The edges of the net are additionally reinforced with double material for extra strength, resulting in a longer lifespan. As a parent, you might be somewhat stressed over the frame and springs since they are supposed to be very tough to keep them from breaking apart. Upper Bounce secures these hard parts with safety pads that really work. The safety pads protects the jumper from landing on the steel frame or getting hurt from the springs. The strong and high-quality pads feature 1-inch thick foam thickness EPE, which contains the best shock absorbing properties. The high-density closed-cell foam does not absorb mildew, water or lose shape. In addition, the pads feature 450g PVC on top and 310g PE on bottom. Pretty easy to assemble and disassemble when needed. 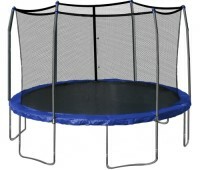 Durable construction; sturdy steel frame and strong jumping mat. High level of safety guaranteed by protective safety pads and high-quality safety enclosure. Superior comfort provided by thick foam padding and pole foam sleeve. Large jumping space in the 16ft trampoline. The Upper Bounce 16ft Trampoline comes with great safety features that will protect your kids from injury, as long as they use it legitimately. 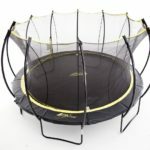 Parents will love the easy assembly and take down of this large trampoline plus the durable components that make up the unit. 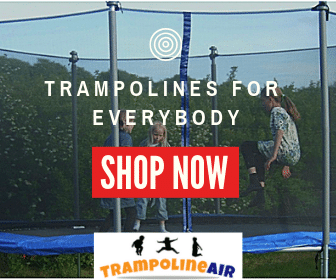 There is no need to buy a cheaper trampoline and end up replacing parts now and then, get this Upper Bounce version and let your children enjoy many years of play. 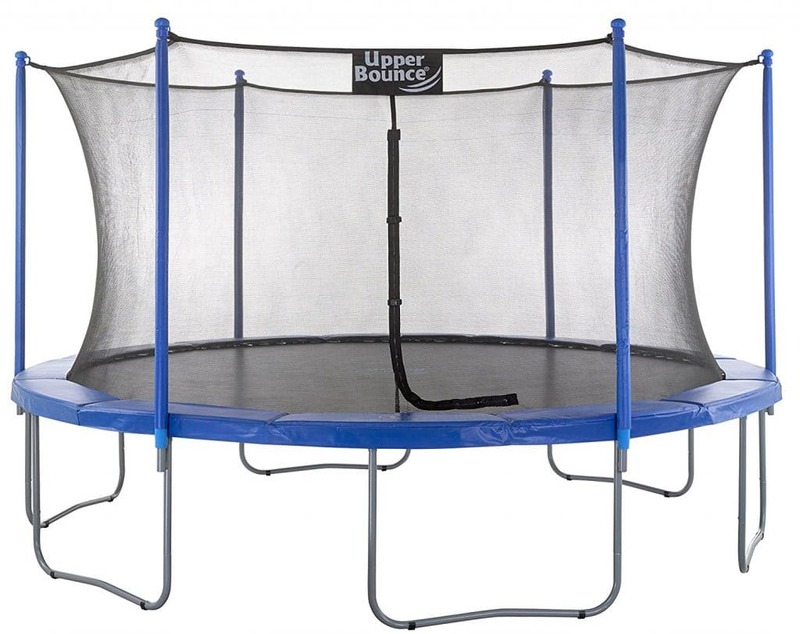 We find it a bit pricy but with such quality features, the Upper Bounce 16 foot trampoline is a sure bet that wins value for money. For whatever reasons, Upper Bounce recommends that you have an expert to assemble this 7ft trampoline for you. Of course, you can do that at your ideal time. The process is assumingly easy as the trampoline comes with all the necessary tools and hardware for setup. There are no complicated instructions meaning no hassles or fumbling with tiny parts. Your expert will also make sure that the trampoline is properly inspected for safety. Because of the small size, this trampoline is ideal for indoor use, decks and patios. The trampoline is designed with durability in mind. The frame features high-quality galvanized steel which is known to be a tough material. In addition, it has 6 blow molded legs that provide stability and support. The molded plastic tubing on the base legs is perfect for both indoors and outdoors. 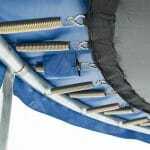 The springs are rust-resistant and specially designed to increase bounce. They are also crack resistant meaning they last long and eliminate the need for frequent replacement. The trampoline comes with a safety net to ensure your kids will stay protected inside the unit. 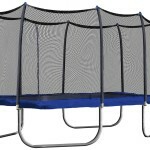 The net is supported by 6 strong curved poles which attach to the base of the trampoline. The net itself attaches to the poles with ties that are fastened around the pole caps. In addition, the net is made of 100% premium Terylene mesh material for enhanced durability. While jumping inside the protective net, kids can also see through it and this encourages their play. Worth mentioning is that the enclosure features a dual zipper wide entrance on the bottom of the net which gives kids easy access in and out of the unit. There are also latch clips to keep the children safe inside the enclosure. 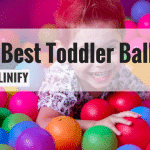 Preventing injury is every parent’s priority and Upper Bounce knows that too. So, they have included a pad protector and pole protector which cover the steel rings and poles to eliminate the chances of injury when landing. The padding features durable Oxford material which is meant to be used on all indoor trampolines. For extra safety, the safety pad includes 3-inch skirt padding all around it, which covers the frame and legs. It offers great durability thanks to the heavy-duty frame, rust-resistant springs and overall body construction. 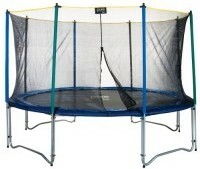 Includes a safety net for protection inside the trampoline. It has a comfortable playing surface due to the all-round padding. Assembly has no complicated procedures and it comes with the necessary tools. It only requires an expert to set up. You can try following the manual but it will prove complicated. It is limited in terms of space. For instance, you can’t jump in to share the fun with your kids. 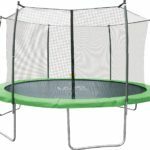 The Upper Bounce 7 foot trampoline is perfect for indoor, patio and deck use due to its small size. It is also ideal for up to two kids to play inside. Assembly can prove somewhat an issue as you need to invite an expert to set it up for you. Once it goes up, it offers a safe and comfortable place for your kids to excite themselves. It is well built from the frame, the safety net and the springs, so it is sure to last through some years. For those parents who want a quality trampoline for their kids to play indoors, the Upper Bounce 7 foot trampoline is a great choice. We have learnt one thing from the Upper Bounce trampoline reviews above; the two products are from the same company but designed for different application. One is large and great for outdoor use and the other is small and suitable for indoor use. Again, it is a matter of providing trampolines that can fulfill different customer needs. These are just a few from the company, they have more trampoline sizes including 7.5ft, 10ft, 12ft, and 15ft. They all have distinct designs and features but the purpose remains the same. The two trampolines in our review can bring fun along with health and fitness to your family. They both boast top-notch features that deliver Upper Bounce promise of quality. Get an Upper Bounce trampoline now and bounce your way to health and happiness.